In Windows 8 & 7, Windows automatically bears the default owner name on About Windows prompt. This is actually comes from the installation of Windows. When you install Windows, the name you provide there automatically assumed as Registered Owner of Windows. 1. To see this on your copy of Windows, Press + R combination, then type “msconfig” in the Run dialog box. Press Yes if prompted for UAC permissions. 2. Switch to Tools and after selecting About Windows click Launch. You’ll get following window. It is clearly shown that default text is the logged user. Now we want to customize it to some other text. Lets see how to do this. 3. In the right pane of the key, you’ll find RegisteredOwner string bearing same text as was in About Windows window (IMG 1). Right click on this string and select Modify. The Value data will be obviously the default text. Put your desired text there. For example, we put Kapil Sparks™. 4. 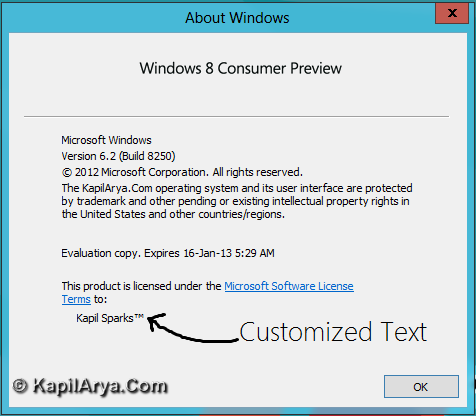 Again launch About Windows prompt and you’ll get your desired text there. thanks bro.. great tip though! you can’t just customize EVERYTHING !!! ^^ It works on Windows 10 too!